From last Friday until tomorrow (2011 August 16), Tokyo’s 上野動物園 (Ueno Zoo) is having a “Night Zoo” special program where guests can stay in the zoo until 8:00PM and see the animals’ behavior at night. I took a picture of this sign at the zoo's entrance. It says "So, let's go to the zoo at night. 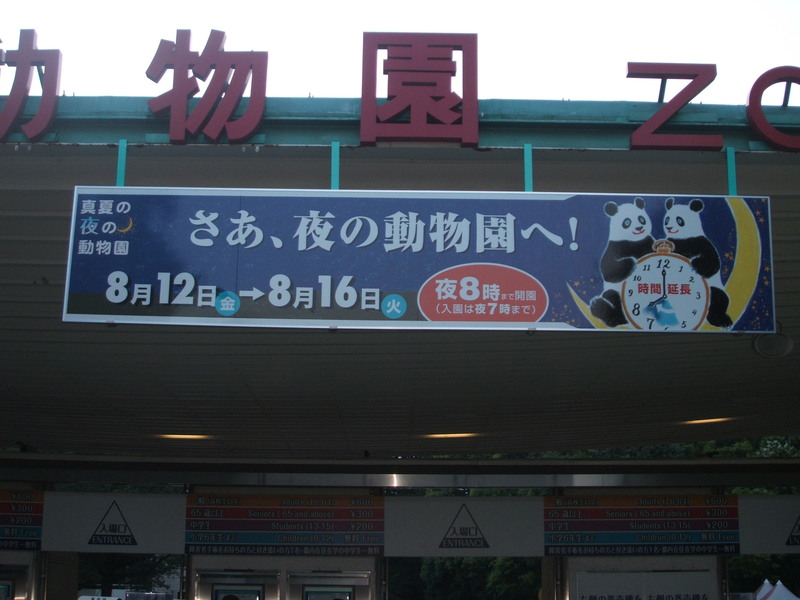 August 12 - 16 until 8PM (last admission is 7PM)"
We went to the “Night Zoo” yesterday. It was fun to go to the zoo at night especially in the summer when it’s sweltering everyday in Tokyo now…because the temperature goes down a bit. 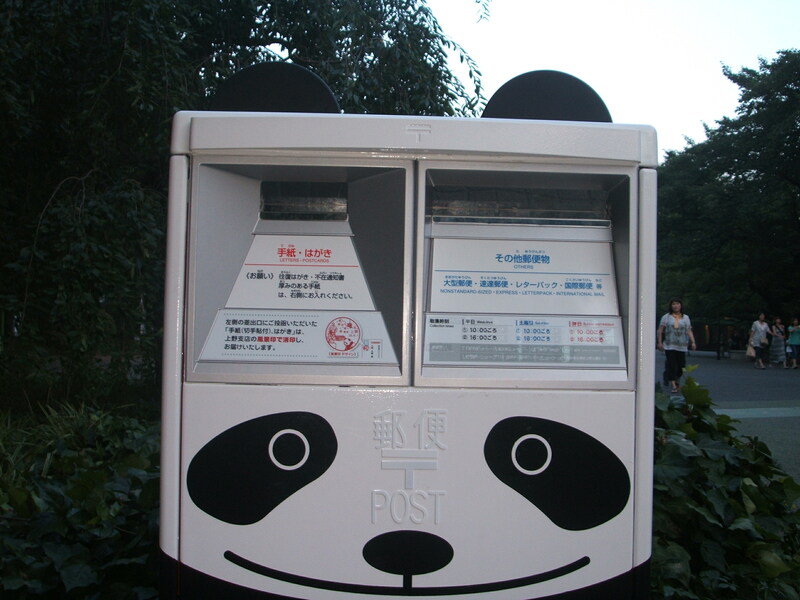 Before we went into the zoo, I mailed a friend of mine a summer postcard from the panda mailbox that I wrote about in this post. 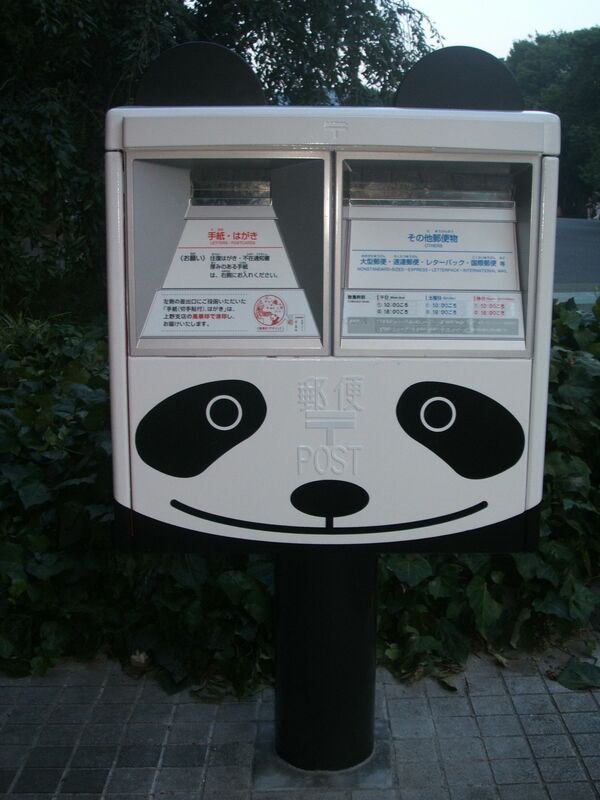 Back of the "panda mailbox". The tail and ears can be seen. Near the entrance of the zoo, close to the panda house, the zoo was collecting donations for the victims of the 2011 March 11 earthquake. 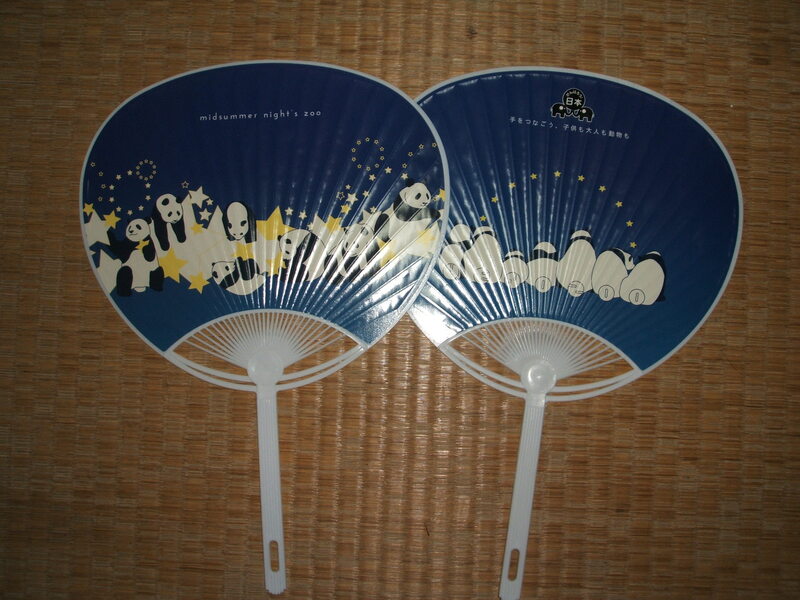 Anyone who donated at least ¥100 (US$1.30 at today’s exchange rates) was given a special うちわ (paper fan). We got a couple of them. 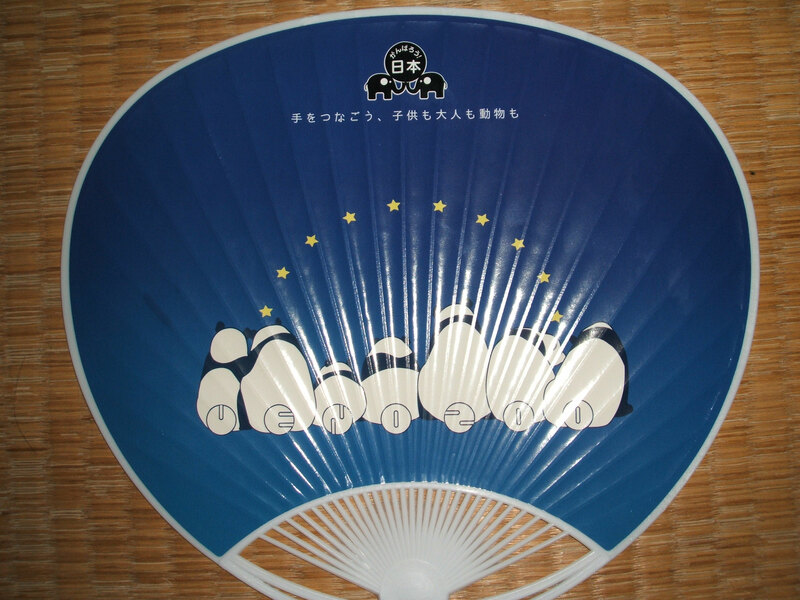 Ueno Zoo "Night Zoo" fans...proceeds go to help the earthquake victims. The front has many pandas and stars and says "midsummer night's zoo"
My camera isn’t so good at taking nighttime pictures, so I didn’t take many photos of the animals. But we had a good time there. We’ve been to many zoos around Japan many times, but this was our first time to go to the “Night Zoo”. Ueno Zoo only has the “Night Zoo” once a year in the summertime…tomorrow is the last day for this year’s “Night Zoo”. So, if you’re in Japan now, you should consider going! Does you local zoo have a “Night Zoo”? Have you ever attended it? ← Robeks is in Tokyo now. What is Robeks? Now that I have a kid coming in January, when he/she gets older, the zoo should be fun. Night zoo sounds interesting, though. Too bad it’s only a short time. Are you expecting a baby next January? Congratulations! Yes, once your child gets to be about two or three years old, they will like the zoo a lot. Ueno Zoo has a nice petting zoo that my kids loved when they were little. Yes, we are. Our first. I’m looking forward to taking our kid out to fun places! >I’m looking forward to taking our kid out to fun places! Well, I think my fiancee and I will work out a way to do this. Of course. That’s being a parent. Yeah, and I think being an English teacher for more than 6 years has helped me with some skills for handling children. However, a teacher is much more limited in what they can do. >a teacher is much more limited in what they can do. And a teacher-student bond is nothing like a parent-child bond! Very cute Uchiwa! Did you see pandas actually? I have heard pandas are more energetic at night. How were they? 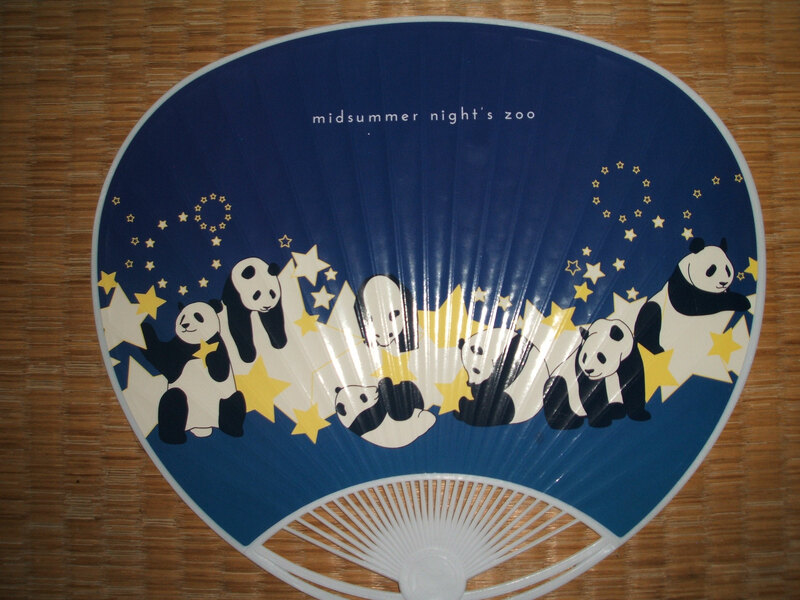 Also, is it true that non-Japanese are not as crazy about pandas as Japanese? >Did you see pandas actually? The long to see the pandas was unbelievably long! So we decided to skip them this time. >I have heard pandas are more energetic at night. Is that right? I didn’t know that. Every time I’ve seen the pandas at the zoo (in the daytime), they were either asleep or quite lethargic. >Also, is it true that non-Japanese are not as crazy about pandas as Japanese? How lovely! This is something my grandkids and I would enjoy. Not sure what the Honolulu Zoo offers at night. You should find out. I’m sure you and your grandchildren would enjoy it. 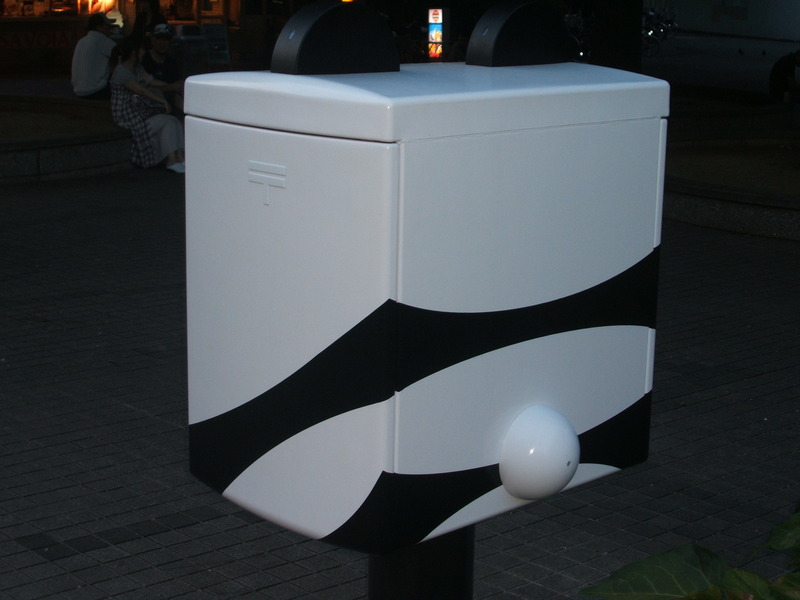 In Japan, many zoos have a “Night zoo” in the summer…not only Ueno Zoo.